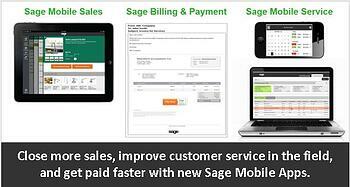 Sage recently unveiled 3 new mobile apps designed to help businesses improve customer service and cash flow. These new cloud-based solutions are affordable, easy-to-implement, and integrate directly with your Sage 300 ERP system. Let’s take a closer look. This native iPad app provides your sales team with the information they need to close a sale at the customer site. Sage Mobile Sales enables you to process quotes and orders, take payments, and collect signatures while out in the field. Sage Mobile Service was designed to improve customer service levels and the efficiency of your field technicians to help businesses gain more referrals and repeat business. Sage Billing and Payment makes it easier for customers to do business with you. This new subscription-based app allows you to choose your customers’ preferred method of invoice delivery (paper or electronic) and then easily process electronic payments - which reduces paper costs, saves time, shortens the A/R cycle, and gets you paid faster. Electronic payments can be processed by credit card or ACH. Sage Billing and Payment also provides your customers with a 24/7 web portal so they can manage their accounts and make payments online and on their own time. You also get an online dashboard with the ability to quickly re-send outstanding invoices and view invoice delivery history. All these new Sage Mobile Apps are connected through the Sage Data Cloud which is hosted in Microsoft Azure and connects to your Sage 300 ERP system. Sage Data Cloud is the glue that connects your on-premise ERP software with a world of cloud applications without the need for added web servers or any other special hardware. Contact us with your questions or to learn more about the new Sage Mobile Apps.